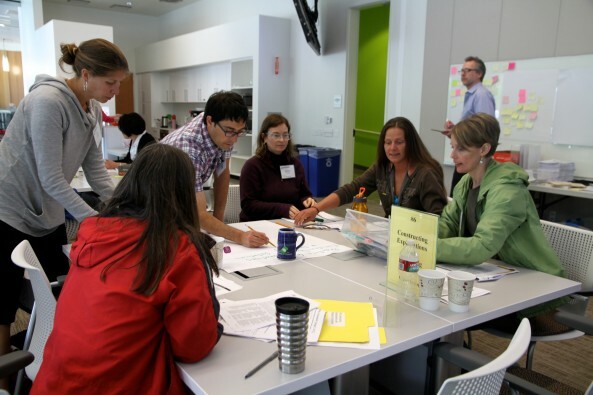 Teachers from Seattle Public Schools and Renton Public Schools participate in a program to integrate Next Generation Science Standards into curriculum. JUNE 24, 2013 — Dr. Lee Hood, ISB’s president, says that we have to “infect” kids with the excitement of science. The same can be said about their teachers. It may even be more crucial to inspire teachers, because they’re the ones who have the most impact on the greatest number of kids. At ISB, the transfer of knowledge to society is a part of our core. Supporting K-12 science educators is intrinsic to our mission to change the world. ISB and our partners at the University of Washington’s College of Education and College of Engineering have teamed up to work with elementary teachers from Seattle Public Schools and middle school teachers from Renton Public Schools to develop curriculum enhancements that incorporate the Next Generation Science Standards. Today, ISB hosted 40 elementary teachers from SPS and 20 middle school teachers from RPS for a workshop to begin the work to adopt NGSS. The NGSS are separate from Common Core Standards, which focus just on math and English language arts (and have caused some controversy as this NPR report explains). Seattle Public Schools will partner with Renton School District, University of Washington College of Engineering, and the Institute for Systems Biology. The project will focus on professional development to deliver science modules that address teachers’ knowledge of science and engineering content and pedagogy with tools to support planning of and reflection on science and engineering instruction. Teachers will create three sets of adaptations to common instructional materials/science kits focusing on different science domains each year. Teachers will also collect student work samples and have opportunities for metacognitive reflection of their own learning and planning for instruction. This is supported at the schools through collaboration structures such as early release or late start as well as principals attending the content-based workshops. This work will be guided by content experts in the field and development of materials will be aligned with important Framework Practices and the Washington State K–12 Science Learning Standards/NGSS. K-8 teachers will benefit from the professional development and all developed materials will be disseminated for state-wide use. It was a privilege to work with teachers today. This video features Marian Wagner, who teaches fourth and fifth grade at Seattle’s Salmon Bay School. Her enthusiasm for teaching and for science is infectious and inspiring.